Moist to dry. Meadows, prairies, roadsides, shores. Sandy soil. 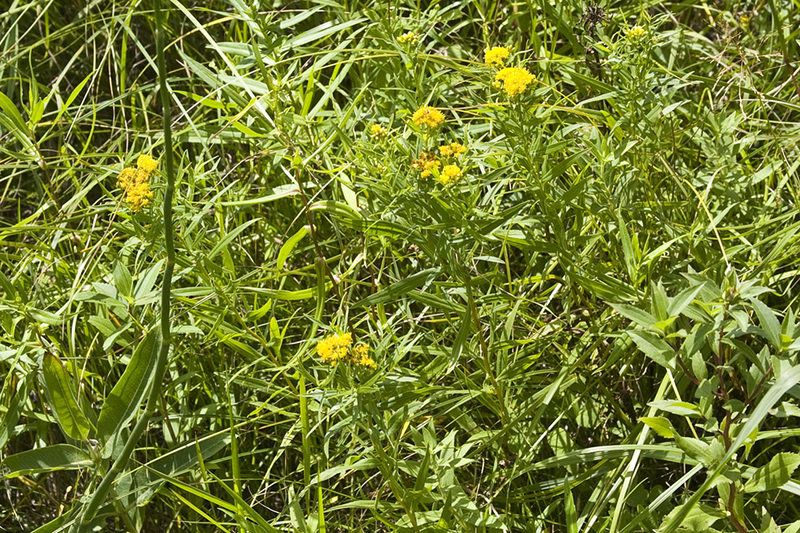 This is a 12″ to 48″tall, erect, perennial forb that rises from a rhizome. The roots and leaves exude toxic chemicals that inhibit the growth and survival of competing species (allelopathy). 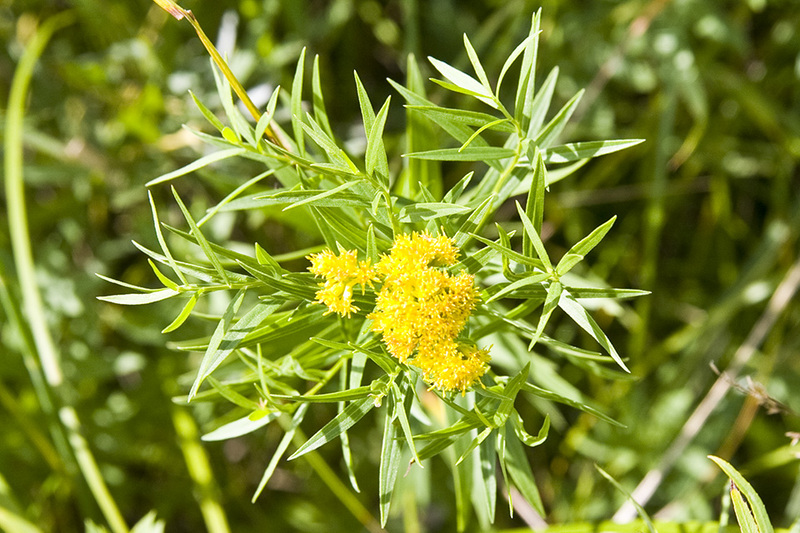 The stems are erect, leafy, and often branched in the upper quarter. They are either hairless or densely covered with short, spreading, stiff hairs. They are not glaucous. 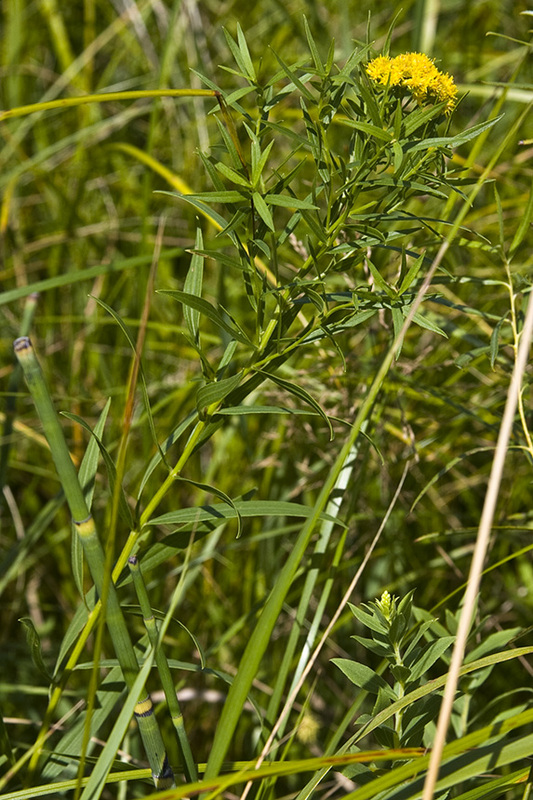 The linear, grass-like leaves are alternate and very long and narrow, 1½″ to 5″ long by ¼″ wide, 7 to 20 times as long as wide, becoming smaller as they ascend the stem. They are not folded. The larger leaves have three conspicuous veins, often with two fainter lateral veins. The smaller leaves usually have only a single conspicuous vein. They do not wrap around (sheath) the stem at the base. There are tiny brown to black resin dots on the leaf surface. The inflorescence is arranged in small, dense clusters at the end of the stem and side branches. 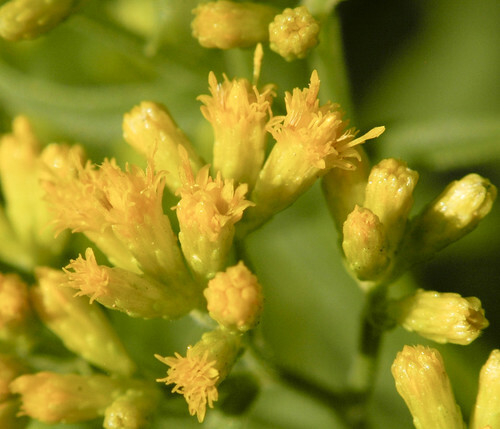 The clusters are about 1¼″ clusters wide and have of 20 to 35 mostly stalkless flower heads. 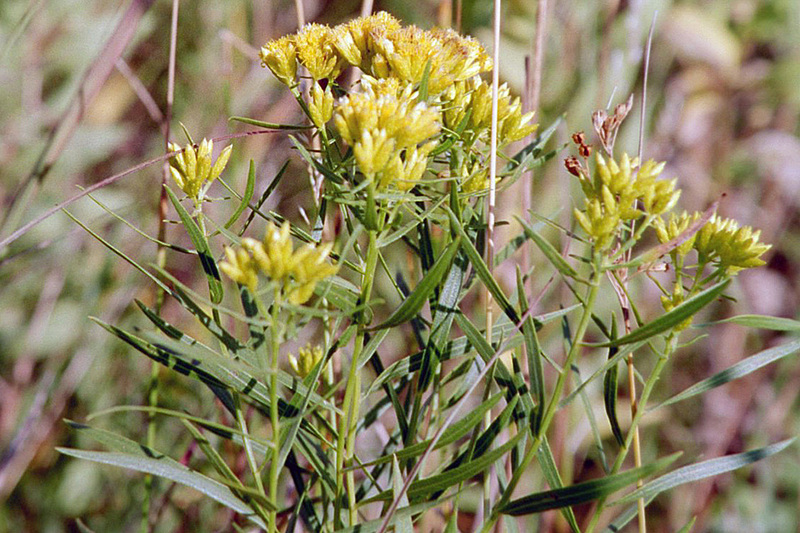 Together they form a broad inflorescence up to 11″ wide that is usually flat topped but may appear rounded. 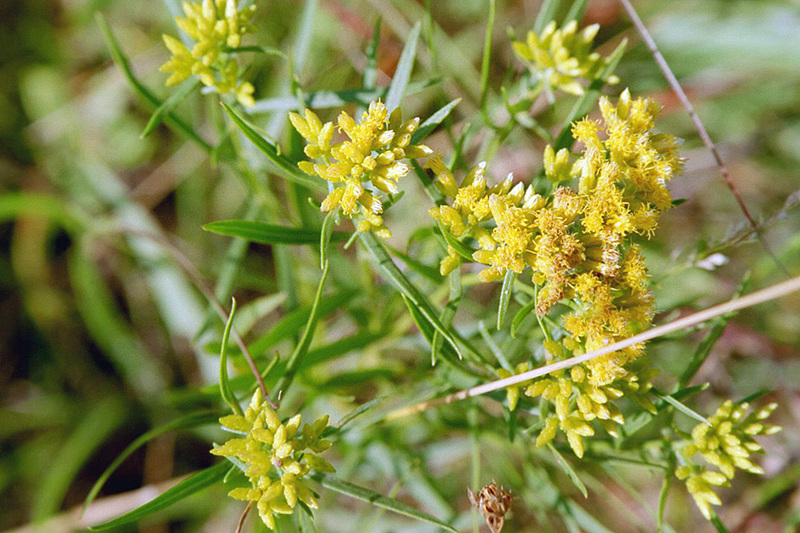 The flower head is smaller than most other goldenrods, only about ⅛″ across. It has 7 to 35 but usually 17 to 22 yellow ray florets and 3 to 13 but usually 5 to 7 yellow disk florets. 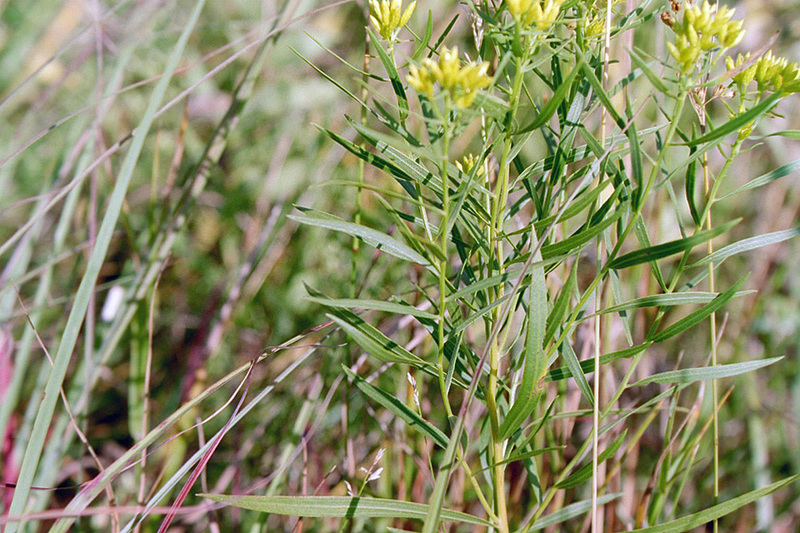 Riddell’s goldenrod (Oligoneuron riddellii) has grass-like, folded leaves that sheath the stem at the base. 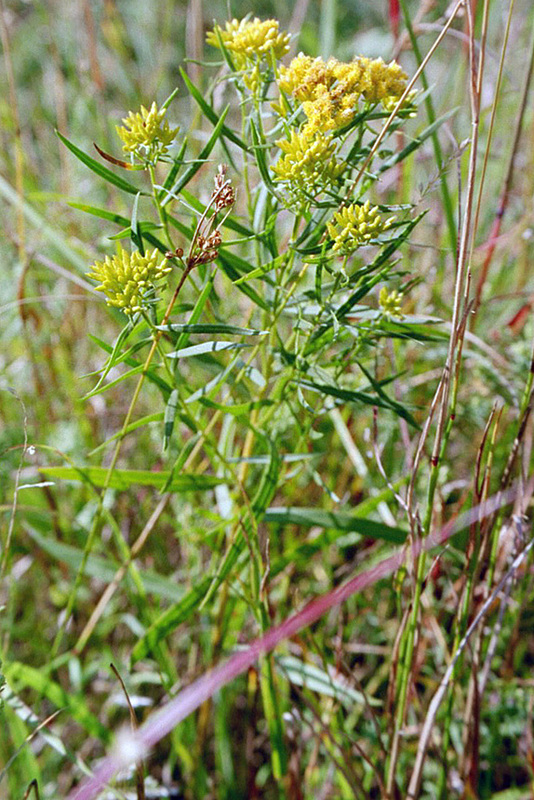 Great Plains flat-topped goldenrod (Euthamia gymnospermoides) leaves, even the largest leaves, have only a single central vein, and have a large number of resinous dots on the surface. The flower clusters have 10 to 21 flower heads. 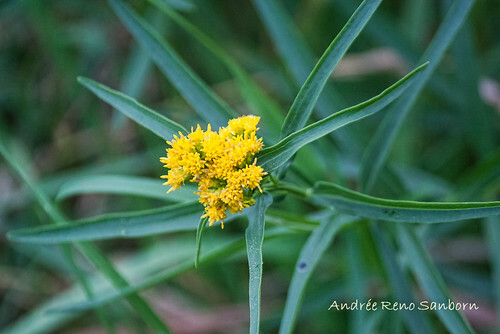 There are 10 to 14 ray florets in the flower head. 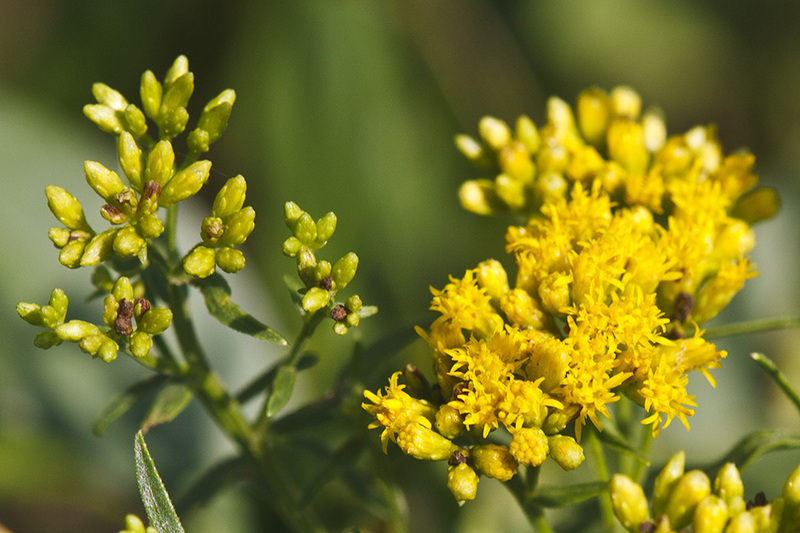 A study in 2002 showed that grass-leaved goldenrod inhibits the growth and survival of competing species by exuding toxic chemicals from its roots and leaves.